I want to welcome you to Winston Unity Center, named after our former National Chairman, Henry Winston. Winnie, as he was affectionately known, would be very happy that we are meeting this weekend to turn our attention to the twin tasks of building a transformative movement and party. Few things were closer to his big heart. I hope each of you brought your thinking cap to this conference. Its success rests on your active and thoughtful participation. So don’t be shy, don’t hold back, tell us what you think. It is easy to become frustrated with the pace and scale of change in recent years. Over the past 30 years or more, the working class and its allies have lost far more battles than we have won. Nearly every section of the working class — none more so than racially oppressed and women workers — has lost income, job opportunities and rights as the capitalist class has ferociously pressed its offensive. Entire regions have been turned into economic wastelands. Many cities have become concentrations of poverty, inequality and racial segregation. The temperature of the planet has tacked upward at rates that, if they continue, could endanger life on our fragile planet. And wars, the buildup to wars, and the steady expansion of U.S military presence worldwide for geoeconomic and geopolitical advantage — albeit disguised in the language of containing threats to peace, stability and democracy — has continued no matter who occupies the White House. The election of President Obama in 2008 and his reelection in 2012 gave millions hope that this awful situation would change for the better. But that hope hasn’t been fully realized. To be sure, some positive changes have occurred over the past four years. Stimulus measures put a tourniquet on a hemorrhaging economy, one war was ended and another war is winding down, health care was expanded to millions who up to now had none — to name a few of the accomplishments during these years. Only someone disconnected from the everyday lives of millions would “damn these achievements with faint praise” or, worse still, give them no praise at all. As for us, we not only acknowledge positive changes, but we also note that they were in no small measure the result of the persistent efforts of an energized movement of which we are a part. Still, the day-to-day lives of most working people — and I’m using the term broadly, not narrowly as is sometimes our habit — have improved far less than what most had hoped on that historic night four-and-a-half years ago when the American people elected the first African American president in our nation’s history. In fact, the main trends that frame life for the multiracial working class continue to slope downward or move sideways. Part of the explanation is that the economic terrain — offshoring, new technologies, the decline of old industries, new international competitors, and so forth — shifted in ways that have been disadvantageous to the working class over the past three decades. Another part of the explanation is that the economic crisis that broke out five years ago and rambles on more or less unabated cut the ground from underneath working people here, not to mention on a world scale. But the main factor explaining the grim circumstances in which the working class finds itself is the one-sided intensification of the class struggle by the capitalist class. What I’m saying, if it isn’t clear, is that it isn’t mainly changes in the overall economic environment that account for long-term wage stagnation, double-digit real joblessness, growing income inequality, and the erosion of democratic rights, liberty and democracy. It is, instead, the result of a sustained and successful counteroffensive of the 1 percent to reassert its class power, privilege and wealth at the expense of tens of millions. This offensive was, and still is, as much political and ideological as economic. With its army of well-paid lobbyists, its dense network of think tanks and institutes, its control over the major means of communication, and its super pacs that — thanks to the Supreme Court — can now throw unlimited amounts of money into political campaigns, the hooks of Big Business are deeply embedded in the governing process at the federal, state and city level, as never before. And if you think this unrestrained offensive is easing up after nearly 40 years, you are badly mistaken. It has lost none of its ferocity. In fact, the owners of the commanding heights of the economy are exploiting the current economic crisis to double down on their efforts to further shift wealth into their hands — not to mention to further weaken, if not destroy, the labor movement as well as other organizational citadels of people’s power. In the epicenter of this offensive at the moment is the battle over so-called “entitlements.” While they wrap their attack on earned income benefit programs in the gown of “good fiscal governance,” the actual aim of broad sections of the capitalist class is pretty clear. It is to eliminate the whole bundle of rights and benefits that the American people secured in battles going back to the 1930s. So far a broad people’s coalition has prevented any weakening of Social Security, Medicare and Medicaid. But the battle is far from over. Which leads me to ask: is it any wonder that the hopes of tens of millions for a progressive turn in U.S. politics have yielded to a day-to-day grind that feels more like the past than a future filled with promise? The answer is “NO.” It isn’t any wonder. But we can’t leave things here. Reality is many-sided, complicated and contradictory. And political reality is no different. To be more specific, intertwined with the corporate offensive is the emergence of a broad people’s movement which has been fighting like hell over three decades to keep what was won in earlier struggles. It doesn’t yet have transformational power, by which I mean the political and organizational capacity to effect a political realignment in a progressive and radical direction on a national scale. But it does have transformative potential. Now some may say this is nothing but wishful thinking on my part. So I want to take a few minutes to make a case for my claim. And to do so I’m going to lean on an earlier period in our nation’s history. As you probably guess, I’m referring to the 1930s. During that momentous decade, a confluence of factors came together to bring about progressive and democratic political transformations despite a determined and powerful opposition. The ground on which people lived changed dramatically when the bottom fell out of the economy. The conventional wisdom that gave legitimacy to “business as usual” politics gave way to new democratic and class understandings among substantial segments of the American people. Broad democratic unity and alliances of diverse people and organizations came together. Splits in elite circles grew and were skillfully utilized by insurgent forces. New leaders and organizations emerged — none more important than the CIO, and the left grew rapidly. Millions of formerly passive people shed their lethargy, took to the streets, engaged in disruptive actions and not least, streamed to the ballot box. The color line was bridged — not completely and not permanently, but enough to make a new level of multiracial unity a reality. And above all, a transformative, labor-led movement, reaching far beyond the “politically active” and knee-deep in every arena of struggle, materialized — not all at once, not out of thin air or “revolutionary rhetoric” — but out of the lessons learned and relationships built in day-to-day struggles. As a result of all this, the defenders of the status quo and the old economic regime were no match for the liberal, progressive, socialist and communist change-makers. A political realignment took place in a democratic direction. A period of reform ensued. And the role of government expanded to include, among other things, the provision of jobs and economic relief. Now I’m not suggesting that in today’s movement we see a carbon copy of the movement of the 1930s. But I am saying we see some loose parallels that should give us hope that an era of broad, deep-going and democratic (anti-corporate) restructuring of our political and economic institutions is possible. What are some of these parallels? Hasn’t the ground on which people live shifted over the past three decades in dramatic and excruciatingly painful ways? No, it’s not the Great Depression, but it is pretty damn bad. Hasn’t the thinking of substantial sections of the people changed in a democratic, progressive and radical direction? In public opinion polls capitalism’s star is sinking downward, while socialism’s is on the rise. Hasn’t labor taken many important steps to transform itself into a fighting force in the 21st century? Haven’t we seen the emergence of new alliances of organizations and groups on our side of the class struggle? Who would have thought a decade ago that labor and environmental groups would find common ground on many issues? Haven’t we seen a rising anger and militancy across this land of ours? Less than a month ago, our comrades in Chicago joined other Chicagoans in mass civil disobedience to stop school closings. Haven’t people entered the political arena in dramatic ways in the past two presidential elections, despite systematic Republican efforts to block them? Hasn’t anti-racism gained ground, and done so, I would argue, in the face of an amped-up racist offensive coming from rightwing extremism and its corporate backers? And haven’t we been part of a movement that feels like it has transformative potential — if not immediately, then down the road a bit? Of course, a devil’s advocate would quickly remind me that the depth of today’s movement is nowhere near that of the 1930s, that labor density is less than 10 percent, that divisions along racial and gender lines persist, that nearly 50 percent of voters choose to stay home on election days, that individualism still crowds out collective aspirations and struggles, that millions don’t trust “big” government to do the right thing, that rightwing extremism still has a substantial mass constituency and that the Great Depression and the ensuing reforms of the 1930s were singular and unique events that can’t be reproduced in today’s circumstances. I don’t dispute any of this; it’s all true. But I would say this in reply: These factors make our task daunting to be sure, but not so daunting that we should lower our sights, trim our sails or worst of all, give up. I’ll be the first to admit that building a transformational movement with the power to change the politics, priorities and political economy of our nation is not for summer soldiers. It isn’t a get-rich-quick scheme. But it isn’t pie-in-the sky either. It is feasible and doable. The American people shouldn’t settle for a second-rate future. And a second-rate future or worse is what waits if progressive and left activists in the labor movement and elsewhere falter in their efforts to build a movement with transformative capacity. How then do we go forward? What are some of the main ingredients that when taken together, bring about a transformative movement and change? To begin, contrary to what some on the left think, the starting point of transformative politics isn’t political desires and a wish list, but a sober and concrete assessment of the balance of class and social forces on the ground, not least of which is the political consciousness of the majority of working-class people and what they are ready to do. And by this measure, socialist transformation is not on the agenda in the near and medium term. The American people, much like the president, are — to paraphrase Billy Joel — in a reform state of mind. They don’t yet have the desire or the wherewithal to bring down the curtains on U.S. capitalism. Thus, a movement with transformative hopes must be up to its ears in the struggle for jobs, a higher minimum wage, immigration reform, gun control, infrastructure renewal, protecting the climate, preserving earned-benefit programs, reversing the sequester, winning a federal budget favoring people’s needs, cutting the military budget, and many more issues of struggle at the federal, state and local level. Similarly, it should be an energetic part of the struggle to give the Republican Party a licking in next year’s Congressional elections. Defeating rightwing extremist candidates is the key link in moving the whole chain of struggle forward. It will take an expansive coalition of voters, including independents, centrists and even some moderate Republicans. Far from a diversion, these democratic struggles to protect, extend and deepen political, economic and social reforms and change the balance of forces in our nation’s capital are the incubator of a movement that possesses the necessary unity, understanding and capacity to effect progressive and radical change. But some say the grounds for democratic reform within the framework of capitalism have largely evaporated, that the struggle for reforms is fool’s gold. Granted it is more difficult to win reforms in current circumstances. A globalized and cratering economy, a corporate-dominated mass media, a governing structure and rules at the federal level that mitigate against progressive and radical social change, the outsized role of corporations in politics and public policymaking, and not least right-wing obstructionism — all this makes the struggle for reforms more difficult, protracted and complicated. Nevertheless, turning these considerable difficulties into a reason to say nothing (from partial to more advanced demands) can be won should be rejected. It would be tantamount to surrender. Now I realize that many people feel frustrated with the Democratic Party. Who doesn’t? Not in the past 30 years have the top layers of the Democratic Party fundamentally resisted the main direction of neoliberalism — that is, the supremacy of capitalist markets, deregulation, financialization, the pruning of government’s role, and upward redistributive economics. In fact, at many important turning points, Democratic Party leaders brokered deals and greased the skids for neoliberalism. At the same time, the Democratic Party has been a part of the broad “small d” democratic coalition that has blocked the imposition of some of the worst features of the extreme right’s agenda and stymied the right wing’s ambition to gain unchallenged dominance over the federal government. Moreover, since 2008 the Obama administration has advanced many positive reform initiatives, which the movement would be foolish not to welcome and support. Finally, the mass base of the Democratic Party still includes major sections of the people’s movement and a substantial layer of progressive elected representatives who while not completely happy with the centrist positions of its top leaders, are still not ready to bid goodbye and join a new political/electoral party. In these circumstances, it would be foolhardy to refuse in advance to ally with the Democratic Party as a whole or sections of it under any conditions. That would be a prescription for marginalization. Nor would it bring a movement with a transformative agenda any closer to building a new political vehicle that consistently speaks for a broad array of people and organizations who feel the crushing weight of the corporate class and its political sponsors. In fact, it would move it further away. Also vital to building a transformative movement is an understanding of which social forces have to be brought together for progressive and radical change. Not any kind of movement can make fundamental change; it takes more than the left, more than progressives, more than radicalized youth. A transformative movement will only materialize to the extent that it is able to attract the working class and its organized sector, people of color, women and youth into its center. Movements like Occupy (and new forms of organization and struggle always emerge in a period of mass upsurge) can have a dramatic impact on the political discourse of the country and stimulate a surge of activity, but to turn them into the hub of a broader movement with progressive and radical aspirations, as some did, betrays any understanding of the power relationships in capitalist society. Still other ingredients for a movement hoping to challenge entrenched power are a commitment to participate in every arena of struggle, flexible tactics, a readiness to employ various forms of struggle, and robust use of social media. The allergy that some on the left display toward electoral forms of struggle — sometimes dismissively called “electoralism — is wrongheaded. As I see it, a movement that entertains transformative objectives will leave a larger and larger and increasingly independent electoral footprint on the political landscape going forward. A constant struggle for unity in all its forms is also essential to a transformative movement. At its core is the fight against racism, male supremacy, nativism, homophobia and other forms of inequality and oppression. The search for common ground and a common program of action is not at loggerheads with the fight for equality. In fact, the common ground will be wider, deeper and more durable to the degree the broader movement vigorously fights for equality in all of its forms. While in recent decades vast political, economic, social and demographic transformations have occurred, the fight for full racial equality retains its overarching importance. Anyone who devalues the struggle for racial equality and against racism limits the sweep of any victory at best. At worst, it provides an opening to the most backward sections of our ruling class to gain ascendency. Indeed, for three decades racist appeals were the grease that smoothed the passage to power of the extreme right. And this filth has not ebbed since Barack Obama’s election four years ago. Actually, it has ramped up. A firm and broad rebuff to this counteroffensive is imperative. And white people and white workers should be in the middle of this fight. A movement that has transformative aspirations has to strengthen its own political and organizational capacities to reach, mobilize, and unite millions as well. For a number of years people’s organizations and the left — all of which are too small and not yet fully attuned to the times in which we live — have been exploring new ways of thinking and organizing in order to expand their size, influence, and power. Some successes have been achieved no doubt, but this process of renewal and growth has still considerable distance to go. Of particular importance in this regard is renewing the political and organizational capacity of labor and the left, both of which, as I mentioned earlier, played overarching roles in the struggles of the 1930s. It is hard to imagine a qualitative turn in a progressive and radical direction that doesn’t include a far more robust presence and level of engagement of both. Still another ingredient to building a transformative movement is a vision of deep-going democratization of our economic and political institutions. In this era of economic stagnation, multiple crises and shrinking democracy, the reforms applied in the post-World War II period no longer suffice. What is needed is a program that breathes new life into our democracy and challenges the logic, profits, prerogatives and growth imperative of corporate capitalism. Among other things, some public ownership is in order at the level of the commanding heights of economy and an expansion of the existing cooperative/solidarity sector of the economy. Finally, a transformative movement has to “Keep Hope Alive.” The three-decades-old neoliberal corporate offensive, ramrodded first of all by right-wing extremism, galvanized resistance to be sure. But it also crushed the hopes of countless numbers of people for the possibility of social change. Thus a task of a movement with transformative desires is to articulate a compelling and hopeful narrative that convinces millions that collective avenues of action will bring changes for the better in their everyday lives. So far I have outlined what it will take to build a transformative movement. In my remaining time, I will focus on the process of growing and renewing our Party. Our role isn’t to stand apart or declare ourselves the vanguard or show off our political pedigree or flaunt symbols and images from another era. To the contrary, we should be in the thick of day-to-day struggles; we should embrace slogans and symbols that resonate with the experience of the American people; we should be radical, but reasonable and respectful of others. We should have deep appreciation of our nation’s diverse peoples and cultures; we should be drum majors for peace and non-violence even as we articulate the anger that we and others feel. We should be uncompromising fighters against racism, male supremacy, anti-immigrant bashing, homophobia, and other forms of oppression; we should build unity and more unity. We should advance a program of advanced, anti-corporate democracy as well as make the case for a socialism that is deeply democratic and participatory, peaceful, just, ecological, and reflective of our traditions and history; and we should build a much bigger and deeply grounded party, and thus be able to make a far bigger contribution to building a transformative movement of the kind described earlier. It is no coincidence that the transformative movement of the 1930s included a growing and dynamic Communist Party and Young Communist League (YCL). Communists are organizers, but of a particular type. We keep lists, make phone calls to other activists, talk to strangers, burn the midnight oil, employ new forms of communication and organization, etc., but we also bring a strategic sense that allows us to see the main obstacles to progress, the main forces of social change, and a path to move the struggle to a new stage. For the past decade or so we have been attempting to bring everything we do in line with the new conditions of struggle of the 21st century. Much has been accomplished, but the mission of transforming, modernizing, and growing our party is a never-ending journey. That journey includes giving life to our programmatic and strategic polices in the course of grassroots activity and struggle. It includes a commitment to ramp up our presence on the social media. It includes a readiness to further build up our system of education for communists and noncommunist alike, off and online. It includes expanding the avenues of membership input into the decision making process. It includes a willingness to reach out to people and organizations on the left. It includes an updating of the party’s polices, ideology, constitution and program. It includes appreciating the new circumstances and rhythms of the day-to-day life of tens of millions. It includes adjusting our understanding of membership responsibilities to contemporary life. It includes bringing our party’s image, symbols, and slogans into the 21st century. It includes finding a place on and off line for members who for one reason or another are unable to attend club meetings. It includes giving more attention to questions of theory and self-study. It includes a steady increase in the party’s public presence. It includes asking co-workers and friends to join the party as well as become financial sustainers. It includes building a bigger YCL. And it includes growing and training a broadly-based leadership who think independently, organize the party’s work, enjoy the confidence of our members and friends, and represent the party in the public square. Organizing more active and vibrant clubs is the ground floor of transforming our party. It is hard, if not impossible, to qualitatively increase our political and organizational capacity without a much larger organizational presence in the form of clubs at the local level. Just as union power depends on local unions, party power is grounded in a dense network of clubs across the country. It should go without saying that clubs will come in many different shapes and sizes. One size doesn’t fit all. Clubs have to adapt to the comrades who are members of them and to the places where they are located. Some will be statewide, others citywide, and still others located in a neighborhood or workplace. The main thing is that we continue to build clubs into centers of education and struggle. I have gone on too long. Let me end with this. The challenges before humanity are formidable. Living in the early decades of the 21st century is not for the faint of heart. But we should proceed with our discussions this weekend confident in two things. One is that humanity will overcome these challenges with the same determination, spirit, and creativity that it has done at earlier turning points in human history. And the other is that the party and YCL will play their part in this great struggle for a future that is worthy of humankind. NOTE: This version of the report is slightly edited from a previous published version. 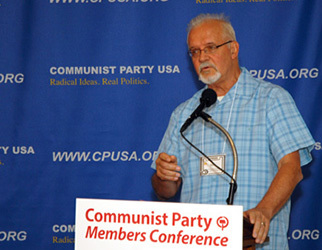 Sam Webb is a member of the National Committee of the Communist Paryt USA. He served as the party's national chairperson from 2000 to 2014. Previously he was the state organizer of the Communist Party in Michigan. Earlier, he was active in the labor movement in his home state of Maine. He is a public spokesperson for the CPUSA, and travels extensively in the U.S. and abroad, including trips to South Africa, China, Vietnam, and Cuba where he met with leaders of those countries. 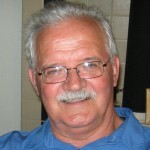 Webb currently resides in New York City, graduated from St. Francis Xavier University in Nova Scotia and received his MA in economics from the University of Connecticut.